Hello, welcome to A Perfect View Window Cleaning Service Inc. We service Minneapolis, St. Paul and the greater Twin Cities suburbs like Eden Prairie, Maple Grove and more. We know window washing is usually the last thing on your list of things to do this weekend and it keeps getting put off and put off. We match the size of your window cleaning job with the proper amount of crew members so we don't eat up your entire day with window cleaning. We are a high end, high quality, affordable window washing company. Our team of professionals takes this burden off your shoulders on a regular basis so you can have sparkling windows year-round and be the envy of all your neighbors. Our 9 step process will leave your windows, screens, and sills clean and ready to enjoy the view of the outside world once again. 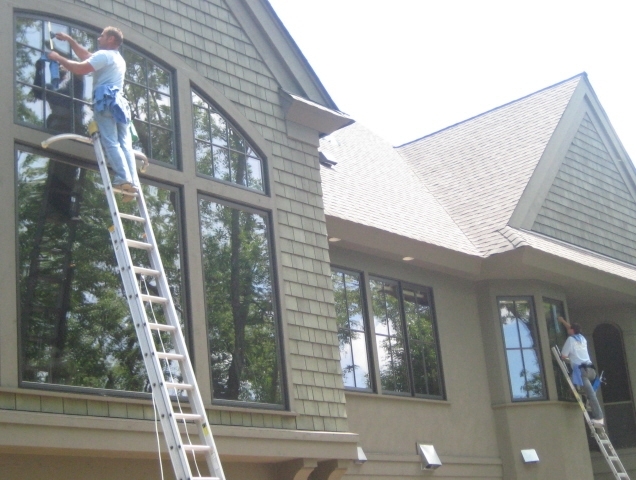 Imagine clean windows without wasting an entire day or getting the ladder out of the garage! Estimates: We'll be happy to provide you a free no-hassle written estimate at your convenience. And we'll back up our estimate with plenty of references along with phone numbers so you can talk to a number of our satisfied customers. Our team also does Gutter Cleaning to prevent your gutters from becoming clogged. If they are already clogged, no problem. Our team will take care of that mess too. We take our business very seriously which means that your satisfaction is our only goal. So...feel free to browse around our site and then give us a call. Our biggest difference that separates us from many of our competitors is not only do I own A Perfect View, but I am also on site for almost each and every job we complete. Unlike many of the larger window washing companies who have employees running the show with little at stake, I personally will make sure each and every job is up to my personal standard to ensure you remain a valued customer for many years to come. We're standing by ready to serve you. Call us for your free no obligation estimate! Check out our Facebook by clicking here! P.S. Window Cleaning is a great gift idea for the holidays, and birthdays. If you are having trouble finding a loved one a gift, we make it easy for you to give them a window cleaning with our gift certificates. Ask us how it works!